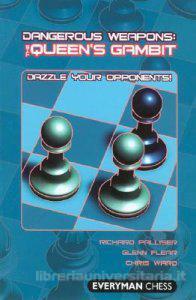 Dangerous Weapons: The Queen's Gambit. Type: BOOKS. Detail: Palliser et al. Product Code: 9781857445466. Category: OPENINGS QG. Publisher: Everyman. 239 pages, softback.Are you tired of playing the same old openings time and time again? Fed up with constantly having to keep up with modern chess theory? Or perhaps you simply wish to play something new and inspiring , but cannot decide between the numerous options available? Don't despair help is on hand!In Dangerous Weapons: The Queen's Gambit, opening experts Richard Palliser, Glenn Flear and Chris Ward team up to investigate one of the most popular openings in chess history, but in a revolutionary way. They concentrate on littleexplored and funtoplay variations of the Queen's Gambit, selecting a wealth of dangerous' options for both colours. Whether playing White or Black, a study of this book will leave you confident and fullyarmed, and your opponents running for cover!